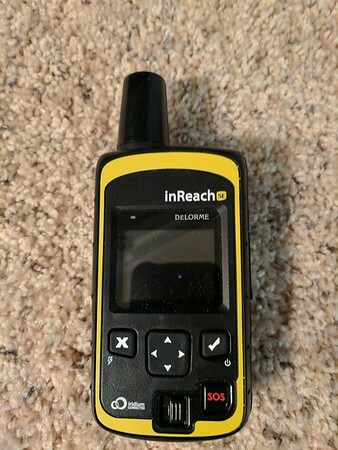 The Delorme inReach SE Satellite Communication device is close to having a real “trail Angel” along with you on all your remote backcountry trips. I must admit I was hesitant to purchase the Delorme and roughly $300 it was an expensive piece of gear. While preparing for my Mt Whitney Summit, I was thinking a lot about safety in the final weeks leading up to the trip. I did a whole lot of planning, from obtaining my permits, ordering custom made maps, and having the right gear for a hike that was going to have lots of snow and large ice fields. What was the deciding factor that made me finally pull the trigger on this expensive piece of gear? Peace of mind. Hiking 75 miles from Sequoia National Park to the Summit of Mt Whitney, with only one other buddy, made me think a lot about safety. 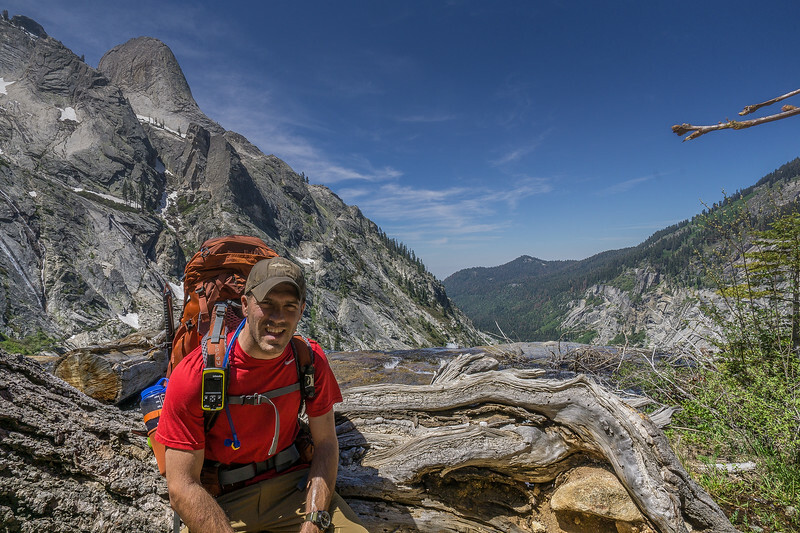 I had a map and compass and the training to navigate the backcountry with ease. I was not looking for a GPS device to fill a gap in my experience. GPS should never be your primary means of navigation or communication if it is you should think twice about your plan. You can plan every last trip, but as they say, no plan survives first contact. If something did go wrong if we got hurt I wanted a lifeline a last ditch effort to survive. Delorme gave me that peace of mind on the trail. With over 100 hours of continuous battery life, an SOS feature, the ability to send text messages back to friends and family, and the ability for my family to track my progress was more than I could ask for. In the picture above, you can see a button labeled SOS, to use it you must slide it to the right and then press. The slide prevents you from accidentally placing an SOS call. 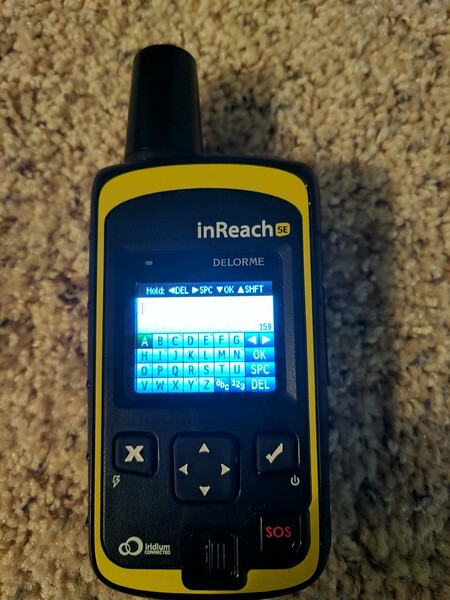 What separates the Delorme inReach from other SOS devices is it doesn’t just send out an SOS call, it allows you to communicate via text messages to the authorities which enables you to give them vital details of your injury or situation while they are en-route. To way, satellite communication is what sets the Delorme apart from its competitors. From the Delorme website, you can set up contacts, by typing in your parents family, friends or co-workers numbers and or email addresses. You can also create pre-set messages so you can send quick updates without having to type out a message on the device itself. Yes, it's not exactly elegant to type on the Delorme, you use the direction pad and the check button to pick out each letter as you type your message slowly…. Two options can make communicating more manageable, the first as previously mentioned is you can pre-program phrases, so its just one click to send. Examples are, “I am ok,” “I have arrived at camp for the night” etc. 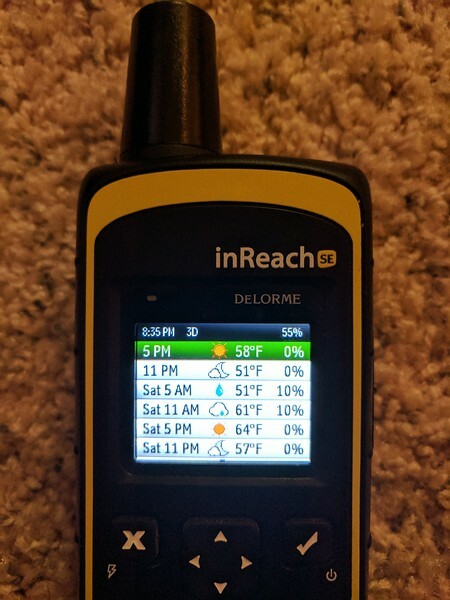 The second option is you can sync your cell phone to your Delorme InReach via Bluetooth using an app Called Earthmate (Android / iPhone). Although the second option is much easier to type, I didn’t use it more than once on my trip. I honestly go backpacking to get away and enjoy being at peace in the outdoors. I had no intention of tweeting and texting every detail, and frankly, some parts were dangerous and like driving you should not be texting while using an ice ax… Secondly, power needs to be managed on a week-long trip, and I found it easier to manage power while having to only charge my Delorme, and not my Delorme plus a cell phone. After some practice, I had no issue punching out quick short messages on the Delorme SE. The Earthmate App offered by Delorme, has a whole host of other features, including a map, and you can even synch trips via the companion Delorme Website for planning purposes. Call me old school, but I didn’t use this feature much either, I planned my trip all on paper maps and navigated using mostly a paper map and compass. Therefore I can not fairly comment much on the other features of the Earthmate app or the trip planning tools on the Delorme website. On the home screen above, you can see another feature, social… You can Facebook or tweet your entire hike too! Yeah no I didn’t use that feature at all, but I could see that it could be fun if I had a lot more blog followers but again I get outdoors to get away. I just mentioned a whole bunch of features other than chat the Delorme has which I didn’t use… so what features of the Delorme did I actually use other than chat? First off, thankfully I never had to use the “SOS” feature, but again it was great peace of mind knowing it was there! The weather was one of the most useful features for the hike. With one click you can request a weather report for your current location, along with a forecast. This proved invaluable as we slowly made our approach to Mt Whitney. Before we unpacked and set up shop, I pulled out the Delorme and requested a quick weather report for our current location. I was able to pull a weather forecast and saw no crazy weather (rain wind etc.) and no crazy cold temps were rolling in that night. Knowing the weather before bed, helped me fall asleep soundly knowing I wasn’t going to freeze to death or be blow off the mountainside. I also frequently checked the weather at Mt Whitney as we got closer, to make sure our summit day would be safe. The weather was indeed one of my favorite features. 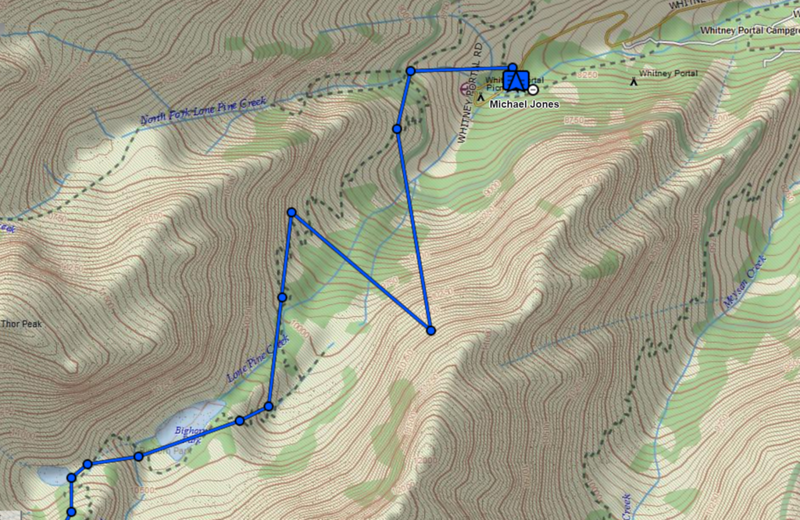 The other great and more obvious feature of Delorme is the tracking feature. With tracking turned on, it will record your location every ten minutes, shoot it back up to a server and then onto a map you can share with friends and family. 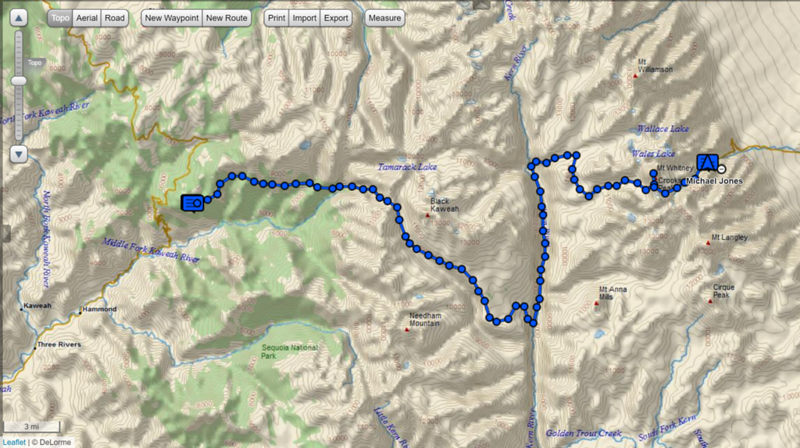 This allows people to essentially watch your hike live with updates roughly every ten minutes. This is the feature my family loved the most, I left my itinerary with my family, and they were able to see my progress each day live. On that second day when we didn’t reach our planned campsite, I knew my family was watching me online. I was able to quickly send a text to my dad, letting him know we were ok and that we were making an earlier than planned stop for the night. So how accurate was the Delorme during my trip? Pretty impressive actually. 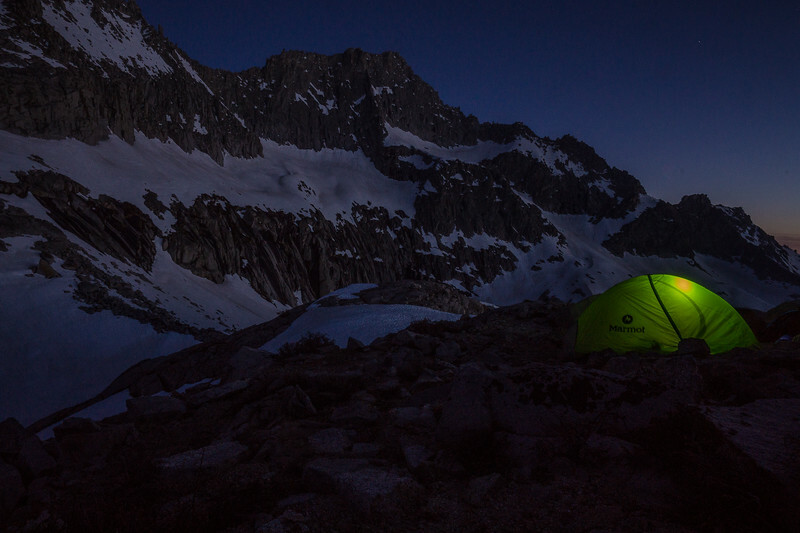 I left my Delorme on 24/7 during my entire trip, I charged it with a battery pack that I brought and a solar panel. Surprisingly the battery lasted pretty great which was another reason not to text via my cell phone; I had Bluetooth off the entire time conserving battery. After my trip, I logged onto the Delorme website to relive my entire trip. Just about 99% of the trip looked like we were directly on the trail, which was amazing. There were very few times off the trail, and most were not because of the Delorme being off but were times when the trail was covered in snowfields or washed out by rivers. Not sure what happened there, but we did not run across the canyon in a zig-zag right at the end. I was to tired to go anywhere other than straight down. For a five night six day trip, I was utterly impressed that only one point was off. 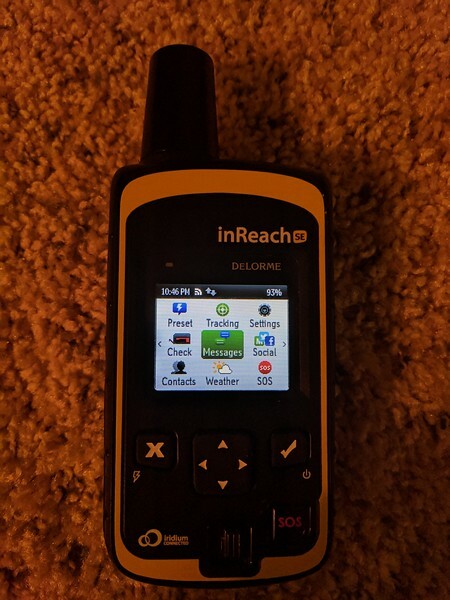 With my entire Delorme InReach experience, there was only one aspect that I was disappointed with, and that was the build quality. When I took this $300 device out of the box for the first time, I was disappointed with the feeling in my hand. It felt like a cheap hard plastic, that would not last. I was expecting the back to be more like a hard rubber. In addition to the cheap plastic backing, the clip on the back also didn’t impress me much. The clip never broke off, but I was extremely careful when trying to detach it from my pack. I wore it on the shoulder strap as shown in the picture above, and I am afraid after continued use it may snap off. Even the port cover that covers the micro USB charging port is cheap feeling plastic which I also believe may break off with continued use. Despite the cheap plastic feeling of the expensive device, It lasted, and I had no issues while on the trail. I would recommend being very careful and never drop or fall on it. Overall I still highly recommend the product! I am currently signed up for the annual recreation plan. 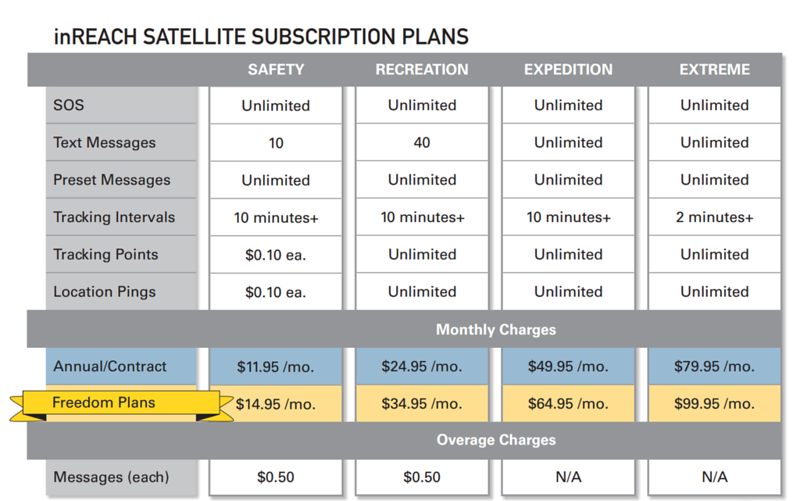 It is the cheapest plan with unlimited tracking. If you go on one or two big trips a year I would recommend the Freedom Plans; I use the annual plan because I use my device as a safety net in my Jeep when I go off roading in the desert when I am not camping. Garmin has since bought Delorme out and just recently came out with the Delorme mini. Looks promising, love the size and weight for a safety device but you also l lose a little battery life and are more dependent on the Android/iPhone app due to the interface on the actual device seems a bit more awkward. CaliHiker I would love to have the new mini just for the clip. As I mentioned in the first post, I hate the clip on the old one. NOt sure how the clip is on the new Delorme that came out before the mini after Garmin bought them though. The DC Rain Maker blog has a great in-depth review and YouTube video of the new Garmin inReach Mini.